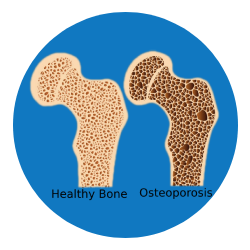 Osteoporosis is a bone disease that is characterised by weak bones and increased susceptibility to fractures due to fragile and brittle bones. It is more common in women than men. It could be due to lower than normal bone mass or greater than normal bone loss. Dull pain in the bones or muscles, particularly low back pain or neck pain.